We're not quite sure how the family behind Sailors Grave manages to sleep, given they welcomed a third child into the world late in 2017, make many of the long round trips from their East Gippsland brewery to customers in Melbourne and Sydney themselves and put out so many one-off beers on top of their core range. Must be something in the coastal air they breathe or the fresh abalone their relos farm... Still, neither the Crafty Pint team nor their growing band of fans is complaining. 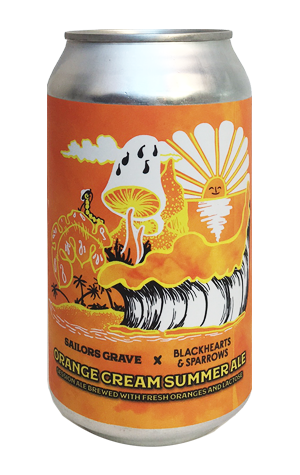 Among those fans is the Blackhearts & Sparrows crew, operators of a large number of top notch bottleshops around Melbourne, who've created their first collaboration beer with Sailors Grave. Again, it's one that looks outside the world of beer for inspiration – to American orange cream soda in this case. To recreate such an experience, they've piled in juice and zest from locally sourced oranges as well as what's becoming something of a signature adjunct for the brewery: lactose. The initial reaction at Crafty Towers was a flashback to the Squid vs Whale "hop maelstrom" they released last year (and which we felt attracted a surprising lack of chatter compared to some other Sailors Grave beers) – juicy orange citrus aromas rounded out by the lactose. It seems the beer underneath has been kept as simple as possible to allow its non-traditional ingredients to shine, with the result a beer that remains lively and refreshing despite the creaminess at its heart.